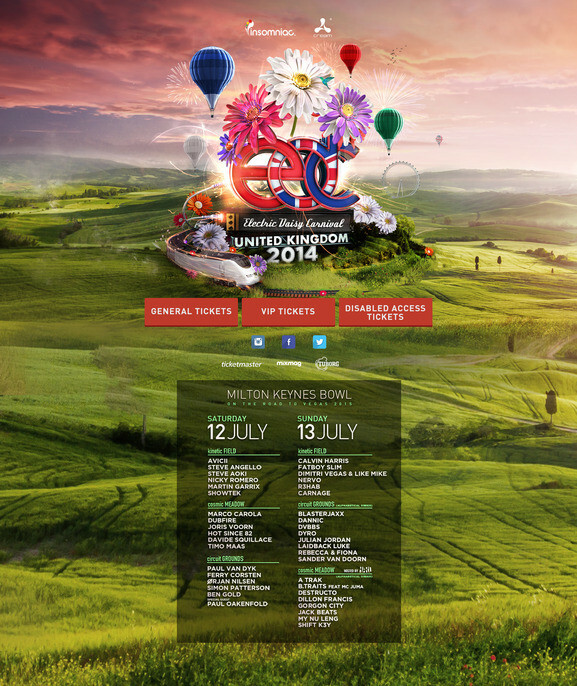 On Saturday 12 July and Sunday 13 July, Electric Daisy Carnival (EDC) will return to the UK for a two-day party. Electric Daisy Carnival UK will transform outdoor entertainment venue Milton Keynes Bowl into a brand new world, with stages including Kinetic Field, Circuit Grounds and Cosmic Meadow. The festival will feature its signature creative elements including state-of-the-art production, special effects, roaming costumed performers, interactive art installations and the biggest LED show, never seen before in the UK, for one weekend only. On Saturday 12 July, Avicii will take over the decks of the Kinetic Field. Steve Angello will also play, as well as Steve Aoki, Nicky Romero, Martin Garrix and Showtek. Circuit Grounds will present Paul van Dyk, Ferry Corsten, Ørjan Nilsen, Simon Patterson, Ben Gold, and a very special guest appearance from Paul Oakenfold. Cosmic Meadow presents Marco Carola, Dubfire, Hot Since 82, Davide Squillace and Timo Maas. The UK’s very own Calvin Harris takes to the Kinetic Field stage on 13 July, along with Fatboy Slim, Dimitri Vegas & Like Mike, NERVO, R3hab and Carnage. The Circuit Grounds stage will be transformed on 13 July, hosting some of the leaders and up-and-comers in dance music. Blasterjaxx join DJ Dannic and DVBBS. Dyro, JulianJordan, LaidbackLuke, Rebecca & Fiona and Sander van Doorn also play. The Cosmic Meadow stage takes things harder and heavier with A Trak, B.Traits with MCJuma, Destructo, Dillon Francis, Gorgon City, Jack Beats, My Nu Leng and Shift K3Y. “Every time I think back to the last summer, I’m humbled that over 50,000 fans showed up to share their amazing energy and enthusiasm during our first international show,EDCin the UK. Because of their amazing support we’re bringing the festival back for its second year and, it’s going to be bigger and brighter than before. Milton Keynes Bowl is such a world-renowned venue and we’re excited to transform it into something that’s never been seen before,” Pasquale Rotella, Founder and CEO of Insomniac.